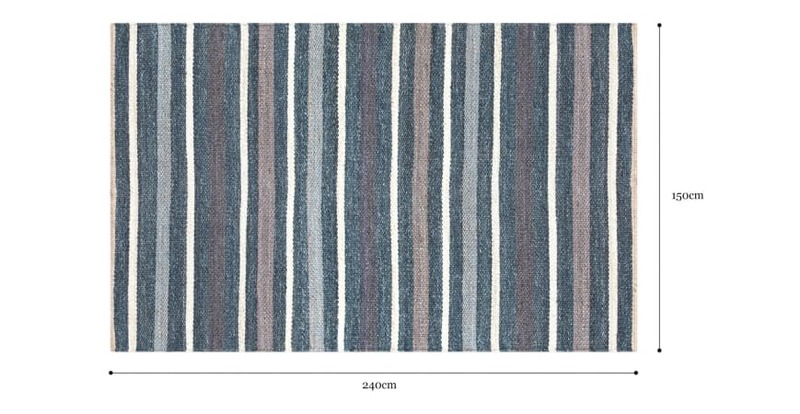 The Rohan Hemp Rug is a unique work of art, combining tones of blue and grey for a soothing and stylish look. The Rohan has been handmade in India from artisans who have passed years of passion and experience down through the generations. The striped design has been crafted from dyed hemp that has been woven with expertise to the finest quality. The texture of the piece is soft, yet with a durable consistency that is ideal for everyday use. The timeless design and muted colours of of the Rohan Hemp Rug make it easy to work into any interior setting. The practical piece looks great when matched with a coffee table or accent chair. High levels of quality and care have gone into the creation of every Brosa rug. Shop the complete collection to see a range of pieces in various colours and materials, and find your perfect fit. Good news! Rohan Hemp Rug 150 x 240cm is currently on display in our Alexandria Collingwood studio.